"Before leaving, I would like, dear bees, to carve my name on these leaves, blessed shrub that has taken all its sap from around your dwelling place. In its shade, I have rested from my weariness, have healed my wounds. Its horizon satisfies my desires for there I can see the heavens. Its solitude is more gentle than deep. You visit it my friends. You enliven it with your singing. And because you do not die, dear bees, you will sing again and for ever, in the surrounding foliage, where my spirit will rest. 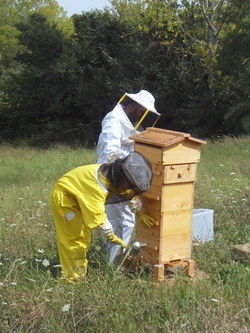 At Costa Digiano we're practicing natural beekeeping methods. For us this means promoting bee health and wellbeing as our top priority, secondly, harvesting some wonderful honey. We do this by allowing bees to build natural comb and by intervening as little as possible in the natural life of the bees. Over the past 2 years we've been experimenting with 3 kinds of hives including the conventional European Dadant-Blatt as well 2 other hives more commonly found in natural and organic beekeeping: the Kenya Top Bar and the Warré. The Warré beehive was developed by a French pastor named Emile Warré in the early part of the 20th century. Warré spent most of his life experimenting with different kinds of hives until he finally developed the people's hive. He intended the People's Hive to be simple and economical to build and easy to manage, as well as very bee friendly because it allows bees to draw out their own natural comb and provides them with the optimal space for safe over wintering. What we love most about the Warré hive is that it requires minimum intervention (so the families are disrupted as little as possible) and provides bees with an ideal home. This makes for healthier, stronger and happier bees.